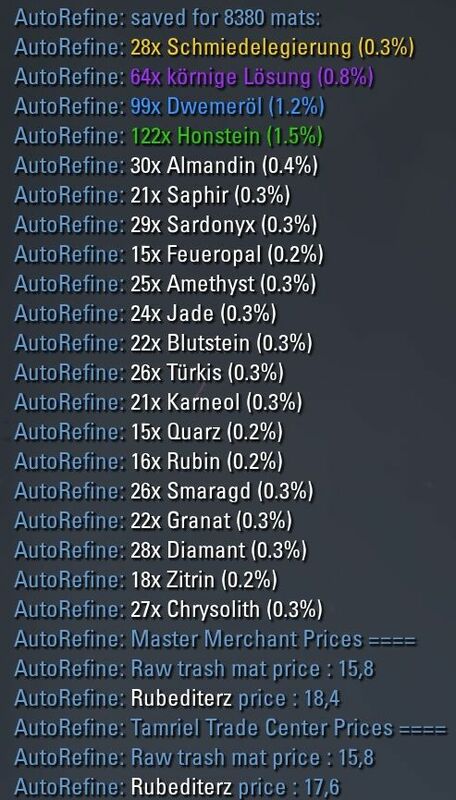 Addon refines raw materials (jewelrycrafting dust, blacksmithing, clothier and woodworking) automatically. It calculates and saves between sessions the amount and probabilities of refined materials. Open craft station, press button "Auto Refine". Result wiil be printed in chat. Results of several attempts sum up. 1) Wrong behaviour for jewelrycrafting refining was fixed. You should reset data for jewelrycrafting in addon settings menu, if you use jewelry traits and jewelry boosters refining. 2) You can turn off print for current refinig result, saved statistics and prices suggestions in addon settings menu. 3) Slash command /arstats for saved statistics and price suggestions were added, special thanks to Zed. Some words about Raw materials prices suggestions formula. If you aren't friends with Math, just believe (or ignore) . For other levels using general formula, because I usually sell this kind of mats to NPC. Let me know, if you need expanded print for low level mats. For jewelrycrafting prices are calculated for all levels. Only Suppress Error Message, but I have the add-on disabled already to try and see any lua errors, but nothing shows up. Thank you, ShinWow. I saw strange issue in your save - for jewelrycrafting negative value were saved. So, I'm going to figure out, how it possible, than fix. Unfortunately, I can't reproduce bug on my account. But I received some ideas from person with the same problem, I think, we'll be able solve issue. Hi, any idea why jewelry refining doesn't show stats in chat? Do u use some bug eater addon? If do, please turn off and send me screen with error. Also u can send me ... \live\SavedVariables\AutoRefine.lua file, I'll try to understand what happens. Last edited by ihause : 02/28/19 at 06:14 AM. For the purpose of refining lots of mats, this works FANTASTIC!!!!. I just refined about 10k of mats while enjoying my morning coffee. Nice work! Last edited by ShinWow : 02/21/19 at 08:03 PM. 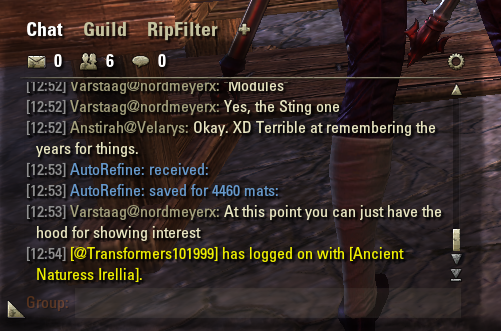 Hi, is it possible to add an option to disable the chat messages posted after refining materials? anyway to speed up the refine process, i know i can refine faster pushing the R button. just curious if there is a way to speed it up in the addon? thanks for your work! Last edited by ihause : 01/23/19 at 01:53 PM. Made a screenshot of my results, maybe it helps anyone. Prices are PC eu but they are missing the Wax etc price in screenshot so I added that. 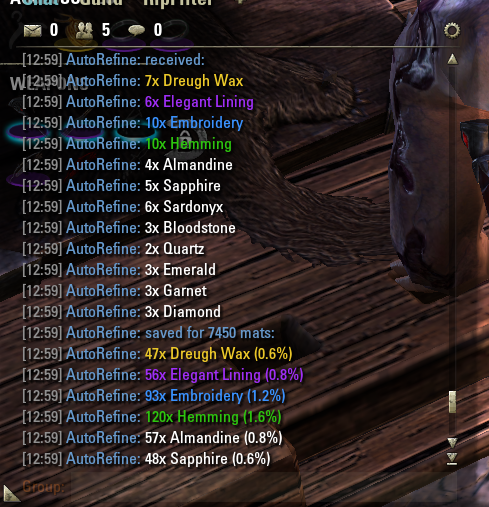 It woud be nice if the addon did the math on buying mats to refine for wax VS selling raw mats and buying wax for it, therefore it woud need to check for the lowest raw price of non max level mat.. In my calculations below I however only check if its worth selling the raw max lvl mats vs refine and selling the result. You should check formula in addon description or addon settings menu, raw mats price incorporates not just gold material, but all materials, that can be refined. 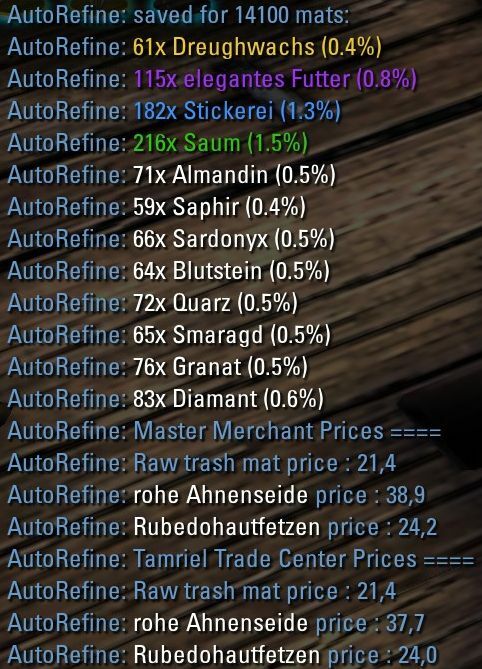 Usually people sell all refined materials. Formula also includes several coefficients for buy/sell profit. You can set these coefficents for your purposes. Last edited by Tonyleila : 01/02/19 at 01:07 PM. First of all thanks for the addon, but can u please create an option to hide the start text: AutoRefine: Init? Multicraft is not what I'm looking for, that's for the automation of crafting items and has nothing to do with refining raw materials. This addon is related to refining raw materials, and that's what brought me here. Ok. I will think about it. Maybe it will be option in settings menu, because I usually sell these items as is, without refining. I appreciate the consideration, and making it a settings option makes total sense. But even if you decide not to, and that's ok too...you really do want to specify on the main page that the style-type raw mats are not covered by this addon. thanks once again, this is a great QoL addition to the game. for style mats and grains is nothing to calculate. There is addon "Multicraft", which can help, if you have many items of one type to refine. 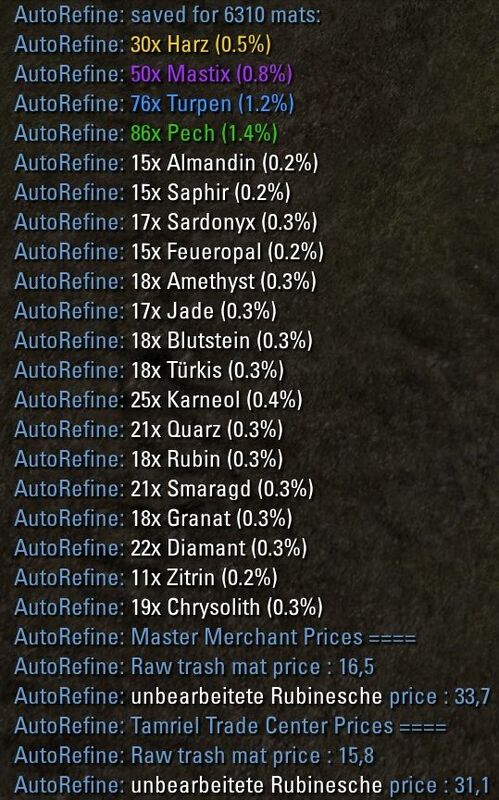 Master Merchant addon needs for raw materials price suggestions. Actually, when I went back to autorefine the Dwemer Scrap after posting this message, it does not refine at all with the autofunction. I expected a second pass to get it, but it didn't. I noticed that there's a chat window message that says "There is not Master Merchant addon". Is that why the Dwemer didn't autorefine? I'm sure that many and maybe even most players who would use this with vending in mind, however, I would use it with obtaining refined mats for crafting in mind instead. So, you're saying that the only things that this addon will refine are the actual blacksmithing, clothing, jewelry, and woodworking crafting raw materials? Leaving out the raw styling materials is not really a big deal because the raw mats for styling are usually in low volume anyway. But I would suggest that you clarify on your main page for this addon, that this is specifically for the raw crafting mats, which you do state, and not for autorefining the raw style mats which is not stated. I do think you'll want to state that in order to differentiate between the two, because some of the style mats are also raw materials that need to be refined in the same manner as the crafting mats. That way, others won't misunderstand as I did. Nevertheless, I will use this gladly, as the bulk of the mats needing refined are still the crafting mats. Last edited by ihause : 10/24/18 at 12:22 PM.